So toady I bring you the last installment of The Superhero Challenge. Today's post is the Ultimate hero so I decided to go down the same path as my Villain nails and show you another character from one of the more non-conventional series. These nails are again Alan Moore who is undoutably my favourite graphic novel writer! This manicure represents V from V for Vendetta. 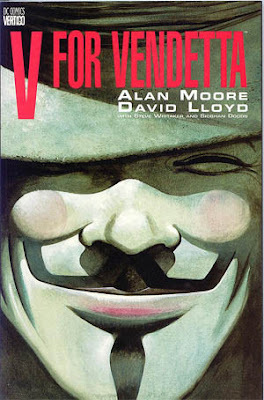 V for Vendetta is a ten-issue comic book series written by Alan Moore and illustrated mostly by David Lloyd, set in a dystopian future United Kingdom imagined from the 1980s to about the 1990s. A mysterious masked revolutionary who calls himself "V" works to destroy the totalitarian government, profoundly affecting the people he encounters. For this manicure I alternated between W7 Black and Barry M Matte White for my base colours. My thumb is blood splatters using a dotting tool and Barry M Raspberry. Then we have V's mustache, 'V' his iconic hat and my pinkie shows fireworks. For the fireworks used a base of Barry M Silver Glitter then added Once Upon a Time which is holographic silver and pink bar glitter. The red is Barry M Red Glitter. Whoa lots of Mr M in this manicure! I have really enjoyed taking part in this challenge, I feel I have really improved my nail art and it has help me think of new and exciting things to do. Also I have loved taking part with all the amazing British ladies who have all done some amazing manicures. I hope we are all able to do a similar challenge together in the future! 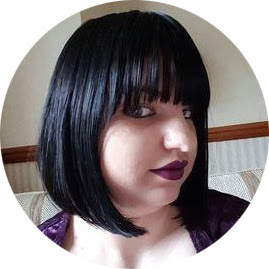 If you want to check out all the manicure's I have done check out my 'Nail Art Challenge Index' tab at the top of the page! What has been your favourite manicure this series, is there someone you think I should have included? Nice! Love the pinky nail on this one. That movie was so good! !